There are many factors to consider when choosing a pressure gauge. Because of the variables, selecting the right one for a given application is not easy, even for a person with a technical background. An obvious initial consideration is how accurate you need the data to be. If your main concern is that the pressure stay within a reasonable range, then an inexpensive analog pressure gauge would likely get the job done. On the other hand, if you need a higher level of accuracy for process- or compliance-related reasons, analog gauges do not compare to the precision of digital pressure gauges. Although modern digital pressure gauges require a battery or another power source, they have many advantages. As examples, you would avoid problems with parallax or operator interpretation, and these gauges can provide pressure readings as accurate as .05% of span. Modern digital pressure gauges also offer the benefits of portability, greater accuracy, and wireless communication (for remote monitoring). The new WIKA CPG1500 features the versatility of analog gauges and raises it to a level only matched by digital calibrators. This thoughtfully designed gauge is an easy-to-use, high performance instrument with new and improved features unmatched in the pressure measurement market. The CPG1500 is extremely useful as both a troubleshooting tool and as a calibration device. The CPG1500 is designed as a multipurpose digital pressure gauge for the oil and gas industry, maintenance and service facilities, and the pharmaceutical sector. It is also useful for power generation and calibration services. With a 360 degree swivel head, this robust and accurate digital gauge can be installed for easy viewing in difficult-to-reach locations, and is ideal for virtually any type of on-site calibration. It is CSA approved as “explosion proof” for use in class 1 div. 1 hazardous areas. The CPG1500 is an intrinsically safe instrument and has IECEx and ATEX approvals as well. And with IP65 ingress protection, it offers reliability and durability despite extreme process conditions. If you need extreme accuracy, then you can’t go wrong with the CPG1500. This reliable instrument provides pressure readings with an accuracy of 0.1% of full span, with an option for 0.05% of full span. With stainless steel 316 wetted parts and a measuring range from 0 to 10,000 bar (0 to 150,000 psi), the CPG1500 is also fully temperature-compensated for accurate readings from –10° to +50°C (+14° to +122°F). The measuring rate (sampling rate) of the gauge can be defined by the user. Typical applications require three measured values per second, but the rate can be set as high as 50 per second. The CPG1500 digital pressure gauge has an energy-saving function whereby the device automatically goes into sleep mode when not in use. Batteries can last up to 2,500 hours when using this feature. Easy-to-use menu navigation makes this new digital gauge simple to install and read. The 5.5 inch, 7-segment display is backlight adjustable, and it features a bar graph and large text field to support the analysis of measuring points on site. 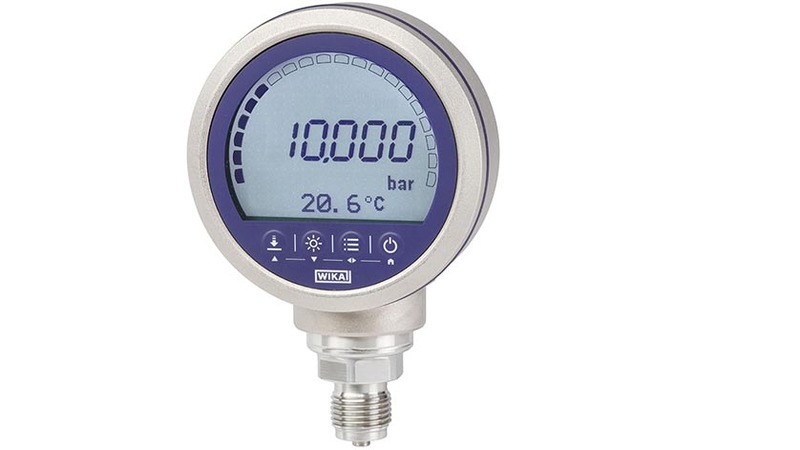 The MIN/MAX function saves the highest and lowest pressure readings automatically, so this critical information can always be seen at a glance. Wireless communication is also provided through WIKA-Wireless using Bluetooth®, which permits pressure measurement data to be logged and transferred to a database for analysis in real-time. WIKA-CAL also offers PG-supported calibration and the management of calibration and instrument data in an SQL database. Let the experts at WIKA show you how CPG1500 digital pressure gauges can improve measurement accuracy and streamline operations at your process facility. Our knowledgeable technical support staff are here to help you solve instrument problems and answer any questions you may have.